DVR manufacturer TiVo has spent most of the last 15 years building hardware that would allow consumers to record their favorite TV shows and watch them later. Now the company is working toward building products that would let consumers save their favorite shows not on a hard drive in a box, but up in the cloud. TiVo’s network DVR offering isn’t coming totally out of the blue. After all, the company has spent the last few years adding cloud-based elements to its service and apps. Part of that was out of a desire to make its products more nimble — you can make changes to a user interface more easily if it’s powered via the Internet — and part was to enable future services. Well, they’re here. With the network DVR, TiVo will be able to deliver the same consistent UI to users without having to have a hard drive in its set-top boxes. That will dramatically lower the cost of producing hardware, and it offers all sorts of new pricing and business models on top of its service. It’s important to note that TiVo’s network DVR won’t be offered directly to consumers. Instead the company is planning to partner with cable, satellite, and IPTV providers to roll out the new service. And those partners will, in turn, will make the cloud-enabled network DVR service available to their subscribers. In addition to making the service available on TiVo hardware that doesn’t have a hard drive built in, the cloud-based services enable TiVo users to access live and recorded content on other devices and apps. 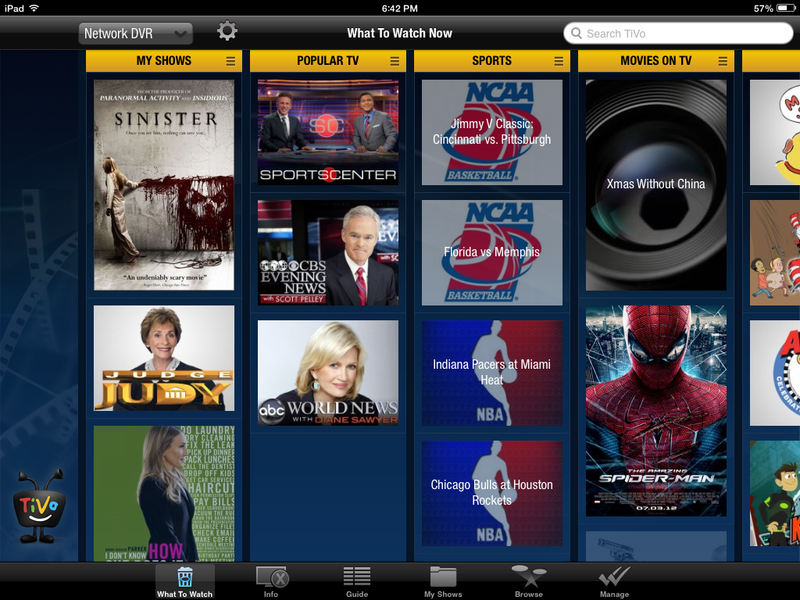 Likesay, TiVo’s iPad app, or a TiVo Roku channel. While TiVo would provide the apps and user interface that consumers see, it would be up to its service provider partners to actually provide all the storage and connectivity to content that would be available. That is, TiVo would be the front end, but Comcast, Virgin Media, or other partners who choose to deploy network DVR with TiVo’s help would do the heavy lifting on the back end. In that respect, its relationship with those providers wouldn’t be that different from how it interacts with Netflix, Hulu, or other streaming video partners, who handle all the storage and delivery for their own. Bu TiVo could enable its service provider partners to manage various content rights, create different tiers of service, and set their own multiscreen policies. One example of new services and revenue models that could be enabled is to allow cable subscribers to buy additional network DVR storage for when they bump up against storage limits. It could also enable them to offer automatically make cloud-based copies versions of popular TV shows and make access available to pre-recorded assets. The new offering points to a major change in the way service providers think about how subscribers gain access to their content. And it’s a big step forward for TiVo into a world where hardware isn’t what powers these types of services.